Vote for Lapland Lake Nordic Vacation Center for Best Nordic Skiing in the Adirondack's Best of 2019! We at Lapland Lake take great pride in being consistently ranked in the top tourism destinations in the Adirondacks! Now, with your help, we can make it official once again! Click the link below to complete the survey and vote us the Best Nordic Skiing Destination in the Adirondacks. 2019 Best of the Adirondacks - Vote Here! You can decide which restaurants, attractions, and hotels are the best in the Adirondacks! Cast your vote today. 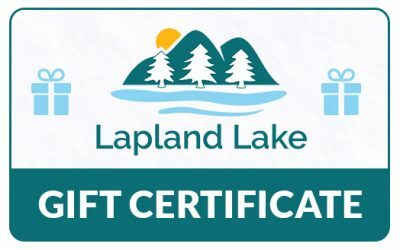 Lapland Lake Gift Certificates may be used for any retail purchase, lodging, or service offered by Lapland Lake. Lapland Lake Gift Certificates do not expire and do not impose any maintenance or service charges. Certificates not used after five years are subject to NY State abandoned property laws. Note sales tax is not collected when a gift certificate is purchased; it is collected and must be paid on applicable purchases when a gift certificate is redeemed. Click here to purchase Lapland Lake Gift Certificates online. Available amounts are $75 and up, in $25 increments. Lapland Lake now sells 2018-19 season advance purchase day passes, day pass with rental packages, and learn to ski packages. These items are available in our online store and make great gifts. The packages (day pass with rental, or learn to ski) have discounted pricing through the holiday shopping season. These 2018-19 advance purchase items may be used on any operating day in the 2018-19 winter season, and will expire if unused. Click here to purchase 2018-19 winter season advance purchase facility use passes and packages in our online store. One more gift idea – we have made it easier to buy a Lapland Lake Season Pass as a gift for another person. Simply purchase the season pass in our online store and fill in the recipient’s name as the pass holder. The recipient will sign our standard liability waiver when they pick up their pass. Click here to download a Gift envelope insert.